Survival knives have a bold history of reliable usage amongst military during the Second World War. The credit was given to heavy blades and pommels due to which the knives were used for several purposes by outdoorsmen and explorers. They have been known by several names such as Rambo knives and hunting knives. Well today, these knives are no longer used for just defense. They have a variety uses ranging right from preparing food to getting warmth. They are used mostly in wilderness for batonning (cutting wood like axe), building wood and net shelters, starting fire, lifting hot items, making tools such as shovel and bow, digging, cutting metallic sheets and seat belts, smashing glass windows, and cutting bandages. Due to so many uses and ability to survive in harsh weather conditions, you might think that it is almost impossible to come across some really cheap survival knives that are reliable and flexible. However, this is not true. You will find several collections of cheap survival knives. But, are they really cheap or are just cheap in terms of money? This is what you wish to find out, right? Cheap Survival Knives: How Cheap They Can Be? For most of us, a cheap survival knife is associated with ordinary artisanship, not so good quality materials of construction, and Rambo like tricks to grab quick attention of customers. One of such tricks is to seize survival items within the handle, which initially appear to be appealing. But the fact is that such a knife does not have enough ruggedness that should exist in any reliable survival knife for being a trustworthy tool for a long time. Well, these are just some facts to warn you against some really cheap survival knives. It simply does not mean that you do not get an inexpensive model having all good features and quality construction materials. There are many such cheap collections available, which are only cheap in terms of money, and not feature or functionality. Yes, it is true that these knives might not have the best construction material, blade, or handle. However, whatever they have, it is enough to last pretty long and survive well in harsh conditions. Such cheap survival knives usually have common characteristics such as forged blade of thick high carbon steel, integral handle, and no joint between the handle and blade. They can withstand more than two tons of pressure and ensure ease of cutting even on hard stuff. You will also never compromise with versatility. However, for having these features, you need to have a medium-sized budget (up to $25). Regardless of the purpose, it is essential to know what type of cheap survival knives are available and how worthy it is to spend dollars on them. If you wish to save without accepting much hit on quality, it is actually fine to go with a cheaper option. This is particularly applicable to those who really cannot spend well on a full-fledged, higher-end piece. If you recollect and apply the law of diminishing returns, it becomes easy to conclude that the survival knives under $25 are perhaps some of the best options for the money. As a rule of thumb, you should choose a knife that has full tang (blade’s steel reaching up to the whole of handle) and no hollow handle. One more thing to remember is that a survival knife is not a bushcraft knife. Most people consider both these knives to be identical. While this is possible in a few cases, there exists a minor difference between the two in general. A bushcraft knife is actually a tool designed for wood cutting in the wilderness. It is one of the wood cutting tools existing in the toolbox that contains a saw, machete, and an axe. A bushcraft knife is almost performs all tasks of a typical knife such as slicing, food processing, and a bit of chopping, shaping, and slicing. A normal bushcraft knife features scandi grind for ensuring easier re-sharpening and strength, full tang, blade of four inches, and no handguard to ensure handling ease. The conventional ones have blade of high carbon tool steel like 1095 but it is possible to find higher quality stainless steels such as 12C27 and VG-10. On the other hand, a survival knife is what most of us consider as the only knife for using in the woods. This is because it is designed to perform all standard survival tasks in the wilderness. Well, it is not easy to accomplish this without compromising on some factors. In most cases, one gets a very big and heavy model that performs satisfactorily when it comes to small tree chopping a small tree. However, the performance is average for whittling. The best survival knife is the one that has a fixed blade and full tang design along with a highly comfortable handle ensuring good grip even in wet conditions. The blade is easy to use; it should not be too big or too thick. Although inexpensive, a good survival knife differs from other types of knives, in terms of usage. This is the main reason why a function is more critical to look for than style, while looking for a survival knife working against the harsh elements of nature. For the budget of $25, the level of competition is low. This means that you will not have to go through a lot of proven competitors. Still, at this price point, your expectations are not going to be low just because the price is less. These expectations usually include easy to use, good factory sharpness, easy to sharpen, versatile, least maintenance, from a known brand or manufacturer, and capability to perform small to heavy medium jobs. You should understand that a 25$ survival knife might not fulfill all of these requirements, as it is quite challenging for it. However, you can expect a majority of them to be fulfilled, especially if it is from a known brand or mainstream collection. Most people believe that a bigger survival knife is always better. Well, this is not true. While a bigger knife can make it easier and quicker to chop or strike, smaller ones are more versatile. This is because they have more uses, such as dressing and piercing. A too big blade makes you give up the benefit of effectively using the knife for detailed tasks such as carving trap sets. Similarly, a small blade is not reliable for highly rugged tasks such as chopping and batoning wherein the blade’s rear is struck with a heavy object for pushing the knife via thick or inflexible wood. This enables the blade to cut large limbs and split wood. According to several survival masters, the best length of blade is between four and six inches. However, at the same time, many users also find it efficient to use an 8-inch and 10-inch blade. Well, it is actually a matter of preference. Still, it cannot be denied that a shorter blade is more flexible in performing smaller tasks. Still, you can choose a longer blade for performing heavy duty or hefty tasks, as it has relatively more power. While a folding knife is ideal for day to day uses, it is not the most preferred choice when it comes to survival. In fact, survival knives have fixed blades. Generally, most survival experts prefer a fixed blade instead of a folding blade. A folding blade is considered a poor choice as it can fold on your fingers, despite having a lock and can break if used vigorously. Further, the angular handles on such tools result in blisters at the time of carving. Because a folding blade has many other folding tools in a knife such as Swiss Army, the required maintenance effort and time also increase. On the other hand, a fixed blade has no moving part to take care of. Regarded as the best type of knife for outdoor survival, it is less likely to break. This is because such blades aim to withstand more abuse than a folding one. However, many outdoor enthusiasts carry two knives: Survival and folding one for hiking and camping, as both have their own uses in those situations. Folding knives are reliable and strong for smaller tasks. So, consider taking both the knives if you are really serious enough to face different circumstances. This is another important choice to make when it comes to having a perfect cheap survival knife. While the debate for taking such a decision is endless, a fully serrated blade is certainly not the choice to go with. This is because nobody can deny the fact that situations will arise when a straight edge will do the job and not a serrated one. In short, you will need both, but more of straight edge is required. In simple terms, go with a partially serrated blade, as that will give you both: An easier to sharpen straight edge and somewhat serrated edge useful for cutting ropes. The serrated portion of the blade is actually toughest to sharpen. A straight edge is also cleaner and free of limitations that serrations tend to face. However, this benefit is again dependent on your level of comfort and what you wish to do with the blade. Even here, the decision is based on the personal preference. Moreover, consider a single-edged blade, and not double-edged one in dagger style. The latter is just not required for a majority of survival uses. In fact, it might prove to be a drawback. Experts recommend a single-edged design having a flat ground spine for survival knives. Further the rear side of a knife, which is also referred to as the knife’s spine, should have a flat grind of 90 degrees. Such a spine is best for striking a ferro rod for starting the fire, which is just not possible with a beveled or rounded spine. Mostly, survival knives are used to baton via big wood pieces. Whether it is the matter of making up a shelter or splitting firewood, a sharpened back edge is just not preferred, as it makes these tasks almost impossible. The back edge of a survival knife is also used as a thumb rest for contributing to more control and leverage while executing tiresome carving projects such as notching triggers for traps. In this case, a double-edge blade simply increases the difficulty level, and at times, proves to be a risky affair. This has to be ‘full’ in case of a survival knife! No choice here! Full tang involves the blade extending until the knife’s length, right from tip to handle’s end. This is essential for the strength required for survival in several situations. A full tang is unlikely to break when the knife is even put to critical usage. If you choose partial tang, it can be quite flimsy while forcing the blade against a tough item or using it as a snooping or digging tool. For these tasks, a full tang knife is more effective. The only cost you need to pay is in terms of extra weight, but it is not that significant. Another issue with partial tang is loosening of blade and risky handle. However, a full tang knife, these issues do not remain. If the handle detaches or gets damaged, it is easy to wrap the tang in rope. It is important to note that a full tang design is more durable than a folding knife design. The association between blade and handle is likely to break long before the wearing and tearing of the blade. Well, this does not render a folding knife less beneficial. If designed using high quality steel, the connection is then sturdy, making the folding blade a truly valuable asset. Believe me, this should be high carbon steel although stainless steel can be your secondary choice. Several types of steels are available for blade in the market today. However, you really would not like to go for a cheap Chinese blade made up of soft steel that is easier to sharpen but does not hold its edge for long. Experts recommend choosing a blade made up of durable steel alloy. Stainless steel is the choice for Every Day Carry (EDC) knives, as they are more frequently used than a survival knife. This indicates choosing a low maintenance stainless steel for EDC knives. However, as a survival knife is used less often but is chosen for more heavy duty jobs, carbon steel is preferable over stainless steel. This material is harder than the normal stainless steel and is capable of withstanding more abuse. The only thing required here is proper good care so that the blade does not stain or rust. While there are many options for such steel, the most popular one is 1095 for survival knives along with its variants. It is famous because it is easy to sharpen and tough too. If you prefer not to grease the blade for keeping it free from corrosion, consider AUS–8, 420HC, or 440C stainless steel. All these alloys vary, but they are easy to sharpen and hold a good edge. If you can grab a deal, consider S30V, a higher end option whose edge retains for longer time. A survival knife should be light in weight so that you can keep your burden down. It is obvious that you do not want to have load in your hand or carry bag unnecessarily. The preference for cutting the bulkiness down encourages one to look for a thin blade. Well, this is not always a smart choice. This is because you need not only a good blade, but you also a blade that will perform a variety of tasks. In real life, it is common to use a survival knife for batonning and then for cutting ropes in the next moment. Moreover, it is not unfavorable to bend a survival knife. All these facts convince one to obtain some cinch to the thickness. However, the thickness should not be such that the blade cannot perform delicate work such as carving trap nets. So, you need to look for the right level of thickness. Survival experts recommend thickness ranging from 0.17 and 0.25 inches. Well, this needs to be a sharp and pointed one. While the answer seems to be quite clear, you will come across many survival knives having hooked, rounded, angled, or straight flat tips. However, there are more justifications for having a sharp pointed tip. Of all, the major justification is self defense against any kind of attacker. Any point except for a sharp spear one is likely to bargain with your ability to stab the tool as a weapon effectively, especially via thick or layered attire. Practically, a sharp knife point is highly versatile to perform all types of tasks while taking survival up lessons or field training. For example, a sharp point tip outshines other knife styles in case of drilling, prying and picking in detail, repairing gear or apparels, chipping, processing a few wild eatables such as walnuts and pine nuts, and reaching in hard to get sections. Well, this needs to be solid and grippy even in damp situations. Most users tend to just concentrate on the blade, as it is the blade that does all the work. However, they need to realize that without a proper hold on the handle, even the blade will not work in the desired manner. Taking this further, the hold should be strong and grippy even in bad weather. This is because some abuse will come to handle while perform tough tasks such as batonning or prying. Thus, while choosing even an inexpensive survival knife, you need to ensure that the handle is durable, grippy, and strong. Otherwise, the knife becomes a source of injuring yourself. When you are out to buy a cheap model, it is wise to avoid hollow, cheap metal or plastic handles. They are just not suitable for a survival knife. It may sound appealing to keep matches and other stuff within the handle. However, this comes at the cost of no density, which subsequently results in compromised knife’s strength. It is recommended to choose a handle that has some texturing and scales, which add up comfortable grip. It is also fine to have a blunt tip for hammering and a hole in lanyard for holding the knife from around the wrist. Plastic and metal are not preferred, as plastic is infamous for its non durability and metal is a good conductor of heat. Further, in winter in wild, metal can result in ice cold grip, which is uncomfortable. So, a synthetic material is the best choice for handles of survival knives. The best materials recommended are derived from modern synthetics and they include Micarta, rubber polymer Kraton, dense rubber, and glass or fiber reinforced nylon. They are almost unbreakable and ensure both grip and durability. This is the bottom section of the handle, which enables you to perform light jobs, crush ice, and use the tool as a hammer. Experts suggest choosing a flat and wide pommel instead of a rounded one. At the same time, the chosen pommel needs to be strong enough to keep breaking risk at bay, especially while hitting truly hard items. Conclusively, these are the factors to consider for buying a cheap survival knife. An ideal model is well constructed, which is marked by full tang, comfortable blade type as well as thickness not more than 1/4 inches, and a balanced grip on a strong handle. It is fine to have thickness as per your needs but try to keep it in between 5/32 and 1/4 inches. Similarly, the blade’s length is also dependent on your needs and preference. However, most buyers consider 4 to 7 inches long blade for enjoying optimal utility. Longer blades are also beneficial, provided you are comfortable with it. The material and grind has a permanent effect on the blade’s shelf life as well as the tool’s wear. Thus, do not choose a low quality material or less effective grind or else the knife becomes more vulnerable to breakage. Beats the fact that a hollow handle storing stuff is bad. This one is an exceptional survival knife in this case. It features a rugged, serrated, and razor-sharp 10-inch long blade made up of stainless steel and ideal for strapping and spear-like tasks. Although not high carbon steel, this one does it work reliably. The blade has two sides, one for cutting wood and the other for preparing food. The cord, hook, pin, matches, and paper are within the handle whose top end shows a compass. You also get a leather sheath. Is a unique piece with Tanto blade that is famous for its piercing ability, especially during rescue operations. The full tang blade measures 3 inches long and 4mm in thickness. It is made up of 440 stainless steel material and has thumb grip. This knife also offers magnesium-alloy fire starter for lighting up a fire, a lanyard with hold, handle formed by thick nylon rope for gripped, nylon sheath, fitted pocket, and hook & loop belt fastener. Is for the one who is looking for maximum extras with a survival knife that is promising to be the most versatile. It comes with a 4.3-inch long blade made up of 3CR13 stainless steel, nylon sheath, textured aluminium handle with no slippery surface, and a small kit in it including compass, rubber band, needle, and a match. 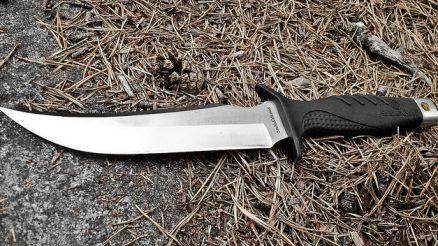 Is a heavy-duty survival knife designed for military uses. It features a very sharp 7″ blade of hard stainless steel having serration at the back and 5-inch handle of rubber ensuring a very comfortable grip. The knife comes with a nylon sheath too. Is unique because it is a folding knife, but is highly reliable one. It comes with partially serrated stainless steel blade of 3.25-inch length and 3mm thickness, quick one-handed unfolding and liner lock, aluminum handle, glass breaker, pocket clip for safe and easy carry, and bottle opener. Remember, no survival knife is of any use if you cannot carry it out all times. Thus, consider a blade that is allowed by the local and federal regulations. Once this is ensured, you need to check out for the above discussed factors as well as price to choose the best survival knife under $25.